Ruby Red to celebrate 40 years of marriage with style……. 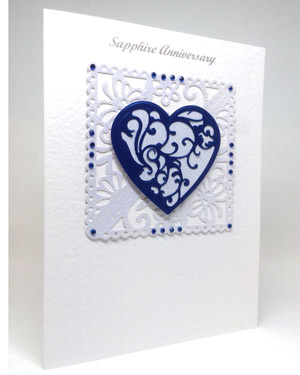 ……..or maybe this sapphire heart and gems will help to celebrate a 45th wedding anniversary . Thank you so much Jean for making a wonderful card just the way I wanted it. Really appreciate all your time, effort and much thought put into it to get it perfect just the way I wanted it. I will definitely be coming back to you in future.